Everyone interested in academic communication should read Amy Fry's magisterial Conventional Wisdom or Faulty Logic? The Recent Literature on Monograph Use and E-book Acquisition. She shows how, by endlessly repeating the conclusion of a single study of a single library now more than 35 years out of date, publishers and their consultants have convinced librarians that traditional collection development has failed and needs to be replaced by patron-driven acquisition. And how, building on this propaganda victory, they moved on to convince librarians that, despite studies showing the opposite, readers across all disciplines preferred e-books to print. Below the fold, some details. On Tuesday, we announced a major new initiative to bring this vision to reality, supported by a coalition of over 40 of the world’s essential scholarly organizations, such as JSTOR, PLOS, arXiv, HathiTrust, Wiley and HighWire Press, who are linking arms to establish a new paradigm of open collaborative annotation across the world’s knowledge. Below the fold, more details on this encouraging development. Over the past fifteen years, our perspective on tackling information interoperability problems for web-based scholarship has evolved significantly. In this opinion piece, we look back at three efforts that we have been involved in that aptly illustrate this evolution: OAI-PMH, OAI-ORE, and Memento. Understanding that no interoperability specification is neutral, we attempt to characterize the perspectives and technical toolkits that provided the basis for these endeavors. With that regard, we consider repository-centric and web-centric interoperability perspectives, and the use of a Linked Data or a REST/HATEAOS technology stack, respectively. We also lament the lack of interoperability across nodes that play a role in web-based scholarship, but end on a constructive note with some ideas regarding a possible path forward. Use case like LOCKSS is the need to answer the question: What are all the components of this work that should be preserved? Follow all rel="describedby" and rel="item" links (potentially multiple levels perhaps through describedby and item). Below the fold I explain what this means, and why it would be a really big deal for preservation. And yet people still wonder why many people are hesitant to allow any sort of software update to install. Philips isn't just turning their product into a wall garden. They're teaching more people that "software update"="things stop working like they did". 20 years ago, Jeff Rothenberg's seminal Ensuring the Longevity of Digital Documents compared migration and emulation as strategies for digital preservation, strongly favoring emulation. Emulation was already a long-established technology; as Rothenberg wrote Apple was using it as the basis for their transition from the Motorola 68K to the PowerPC. Despite this, the strategy of almost all digital preservation systems since has been migration. Why was this? Preservation systems using emulation have recently been deployed for public use by the Internet Archive and the Rhizome Project, and for restricted use by the Olive Archive at Carnegie-Mellon and others. What are the advantages and limitations of current emulation technology, and what are the barriers to more general adoption? Below the fold, the text of the talk with links to the sources. The demos in the talk were crippled by the saturated hotel network; please click on the linked images below for Smarty, oldweb.today and VisiCalc to experience them for yourself. The Olive demo of TurboTax is not publicly available, but it is greatly to Olive's credit that it worked well even on a heavily-loaded network. Four and a half years ago Ian Adams, Ethan Miller and I proposed DAWN, a Durable Array of Wimpy Nodes, pointing out that a suitable system design could exploit the characteristics of solid-state storage to make system costs for archival storage competitive with hard disk despite greater media costs. 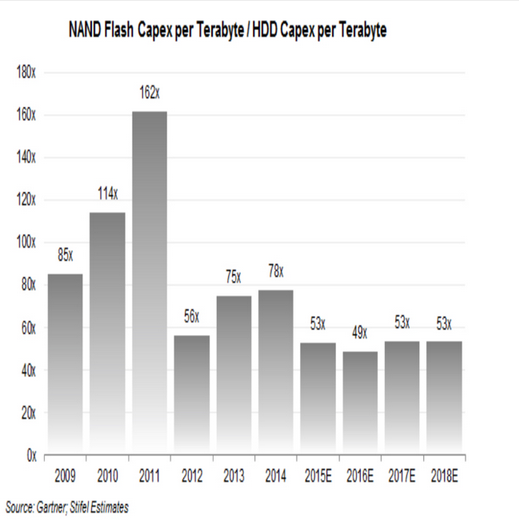 Since then, the cost differential between flash and hard disks has decreased substantially. Below the fold, an update. For some years now the LOCKSS team has been working with countries to implement National Hosting of electronic resources, including subscription e-journals and e-books. JISC's SafeNet project in the UK is an example. Below the fold I look at the why, what and how of these systems. The title is a quote from Coach Junior, who teaches my elder grand-daughter soccer. It comes in handy when, for example, the random team selection results in a young lady being on the opposite team to her best friend. It came to mind when I read Kalev Leetaru's How Much Of The Internet Does The Wayback Machine Really Archive? documenting the idiosyncratic and evolving samples the Internet Archive collects of the Web, and the subsequent discussion on the IIPC mail alias. Below the fold, my take on this discussion. 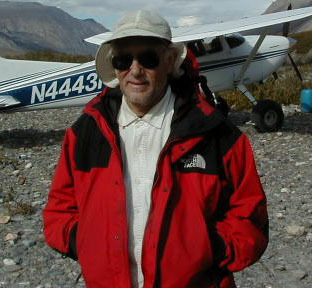 SPARC has a post Author Rights: Using the SPARC Author Addendum to secure your rights as the author of a journal article announcing the result of an initiative to fix one of the fundamental problems of academic publishing, namely that in most cases authors carelessly give up essential rights by signing unchanged a copyright transfer agreement written by the publisher's lawyers. The publisher will argue that this one-sided agreement, often transferring all possible rights to the publisher, is absolutely necessary in order that the article be published. Despite their better-than-average copyright policy, ACM's claims in this regard are typical. I dissected them here. Preserving the author's rights to reproduce, distribute perform, and display the work for non-commercial purposes. Acknowledges that the work may already be the subject of non-exclusive copyright grants to the author's institution or a funding agency. Imposes as a condition of publication that the publisher provide the author with a PDF of the camera-ready version without DRM. The kicker is the final paragraph, which requests that the publisher return a signed copy of the addendum, and makes it clear that publishing the work in any way indicates assent to the terms of the addendum. This leaves the publisher with only three choices, agree to the terms, refuse to publish the work, or ignore the addendum. Of course, many publishers will refuse to publish, and many authors at that point will cave in. The SPARC site has useful advice for this case. The more interesting case is the third, where the publisher simply ignores the author's rights as embodied in the addendum. Publishers are not above ignoring the rights of authors, as shown by the history of my article Keeping Bits Safe: How Hard Can It Be?, published both in ACM Queue (correctly with a note that I retained copyright) and in CACM (incorrectly claiming ACM copyright). I posted analysis of ACM's bogus justification of their copyright policy based on this experience. There is more here. So what will happen if the publisher ignores the author's addendum? They will publish the paper. The author will not get a camera-ready copy without DRM. But the author will make the paper available, and the "kicker" above means they will be on safe legal ground. Not merely did the publisher constructively agree to the terms of the addendum, but they failed to deliver on their side of the deal. So any attempt to haul the author into court, or send takedown notices, would be very risky for the publisher. Publishers don't need anything except permission to publish. Publishers want the rights beyond this to extract the rents that generate their extraordinary profit margins. Please use the SPARC addendum when you get the chance. Enough has happened while my report on emulation was in the review process that, although I announced its release last week, I already have enough material for a follow-up post. Below the fold, the details, including a really important paper from the recent SOSP workshop. Cloud computing; Threat or Menace? Big companies have embraced the cloud more slowly than expected. Some are holding back because of the cost. Others are wary of entrusting sensitive data to another firm’s servers. Should companies be doing most of their computing in the cloud? The Microsoft Cloud creates technology that becomes essential but invisible, to help you build something amazing. Microsoft Azure empowers organizations with the creation of innovative apps. Dynamics CRM helps companies market smarter and more effectively, while Office 365 enables employees to work from virtually anywhere on any device. So whether you need on-demand scalability, real-time data insights, or technology to connect your people, the Microsoft Cloud is designed to empower your business, allowing you to do more and achieve more. Below the fold, some discussion of actual content. I'm very grateful that funding from the Mellon Foundation on behalf of themselves, the Sloan Foundation and IMLS allowed me to spend much of the summer researching and writing a report, Emulation and Virtualization as Preservation Strategies (37-page PDF, CC-By-SA). I submitted a draft last month, it has been peer-reviewed and I have addressed the reviewers comments. It is also available on the LOCKSS web site. I'm old enough to know better than to give a talk with live demos. Nevertheless, I'll be presenting the report at CNI's Fall membership meeting in December complete with live demos of a number of emulation frameworks. The TL;DR executive summary of the report is below the fold. On the 17th of last month Amazon, in some regions, cut the Glacier price from 1c/GB/month to 0.7c/GB/month. It had been stable since it was announced in August 2012. As usual with Amazon, they launched at an aggressive and attractive price, and stuck there for a long time. Glacier wasn't under a lot of competitive pressure, so they didn't need to cut the price. Below the fold, I look at how Backblaze changed this. ISO standards are regularly reviewed. In 2017, the OAIS standard ISO14721 will be reviewed. The DPC is spearheading a praiseworthy effort to involve the digital preservation community in the process of providing input to this review, via this Wiki. I've been critical of OAIS over the years, not so much of the standard itself, but of the way it was frequently mis-used. Its title is Reference Model for an Open Archival Information System (OAIS), but it is often treated as if it were entitled The Definition of Digital Preservation, and used as a way to denigrate digital preservation systems that work in ways the speaker doesn't like by claiming that the offending system "doesn't conform to OAIS". OAIS is a reference model and, as such, defines concepts and terminology. It is the concepts and terminology used to describe a system that can be said to conform to OAIS. Actual systems are audited for conformance to a set of OAIS-based criteria, defined currently by ISO16363. The CLOCKSS Archive passed such an audit last year with flying colors. Based on this experience, we identified a set of areas in which the concepts and terminology of OAIS were inadequate to describe current digital preservation systems such as the CLOCKSS Archive. I was therefore asked to inaugurate the DPC's OAIS review Wiki with a post that I entitled The case for a revision of OAIS. My goal was to encourage others to post their thoughts. Please read my post and do so. Via Dave Farber's IP list, I find that he, Dave Taht, Jim Gettys, the bufferbloat team, and other luminaries have submitted a response to the FCC's proposed rule-making (PDF) that would have outlawed software defined radios and open source WiFi router software such as OpenWrt. My blogging about the Internet of Things started a year ago from a conversation with Jim when he explained the Moon malware, which was scanning home routers. It subsequently turned out to be preparing to take out Sony and Microsoft's gaming networks at Christmas. Its hard to think of a better demonstration of the need for reform of the rules for home router software, but the FCC's proposal to make the only reasonably secure software for them illegal is beyond ridiculous. Any vendor of software-defined radio (SDR), wireless, or Wi-Fi radio must make public the full and maintained source code for the device driver and radio firmware in order to maintain FCC compliance. The source code should be in a buildable, change-controlled source code repository on the Internet, available for review and improvement by all. The vendor must assure that secure update of firmware be working at time of shipment, and that update streams be under ultimate control of the owner of the equipment. Problems with compliance can then be fixed going forward by the person legally responsible for the router being in compliance. The vendor must supply a continuous stream of source and binary updates that must respond to regulatory transgressions and Common Vulnerability and Exposure reports (CVEs) within 45 days of disclosure, for the warranted lifetime of the product, or until five years after the last customer shipment, whichever is longer. Additionally, we ask the FCC to review and rescind any rules for anything that conflicts with open source best practices, produce unmaintainable hardware, or cause vendors to believe they must only ship undocumented “binary blobs” of compiled code or use lockdown mechanisms that forbid user patching. This is an ongoing problem for the Internet community committed to best practice change control and error correction on safety-critical systems. As the submission points out, experience to date shows that vendors of home router equipment are not motivated to, do not have the skills to, and do not, maintain the security of their software. Locking down the vendor's insecure software so it can't be diagnosed or updated is a recipe for even more such disasters. The vendors don't care if their products are used in botnets or steal their customer's credentials. Forcing the vendors to use open source software and to respond in a timely fashion to vulnerability discoveries on pain of decertification is the only way to fix the problems. Bina Venkataraman points me to Adrienne LaFrance's piece Raiders of the Lost Web at The Atlantic. It is based on an account of last month's resurrection of a 34-part, Pulitzer-winning newspaper investigation from 2007 of the aftermath of a 1961 railroad crossing accident in Colorado. It vanished from the Web when The Rocky Mountain News folded and survived only because Kevin Vaughan, the reporter, kept a copy on DVD-ROM. in 2009, the year the paper went under, Vaughan began asking for permission—from the [Denver Public] library and from E.W. Scripps, the company that owned the Rocky—to resurrect the series. After four years of back and forth, in 2013, the institutions agreed to let Vaughan bring it back to the web. With [ex-publisher John] Temple’s help, Vaughan got permission from the designer Roger Black to use Rocky, the defunct newspaper’s proprietary typeface. It still is. Soon, accessing the "coolest part" of the resurrected site will require a virtual machine with a legacy browser. it doesn't once mention or consider the question of what we are going to do about the billions of orphan works that are being "born digital" every day. Instead, the Copyright Office proposes to "solve" the orphan works problem with legislation that would impose substantial burdens on users that would only work for one or two works at any given time. And because that system is so onerous, the Report also proposes a separate licensing regime to support so-called "mass digitization," while simultaneously admitting that this regime would not really be appropriate for orphans (because there's no one left to claim the licensing fees). These proposals have been resoundingly criticized for many valid reasons. We are looking down the barrel of a serious crisis in terms of society's ability to access much of the culture that is being produced and shared online today. As many of these born-digital works become separated from their owners, perhaps because users move on to newer and cooler platforms, or because the users never wanted their real identity associated with this stuff in the first place, we will soon have billions upon billions of digital orphans on our hands. If those orphans survive the various indignities that await them ... we are going to need a way to think about digital orphans. They clearly will not need to be digitized so the Copyright Office's mass digitization proposal would not apply. The born-digital "orphan works" problem is intertwined with the problems posed by the fact that much of this content is dynamic, and its execution depends on other software not generated by the user, which is both copyright and covered by an end-user license agreement, and is not being collected by the national libraries under copyright deposit legislation. Worst of all, our obsession with providing access ultimately results in the loss of access. Librarians created the serials crisis because they focussed on access instead of control. The Open Access movement has had limited success because it focusses on access to articles instead of remaking the economics of academic careers. Last week Proquest announced it had gobbled up Ex-Libris, further centralising corporate control over the world’s knowledge. Proquest will undoubtedly now charge even more for their infinitely-replicable-at-negligible-cost digital files. Libraries will pay, because ‘access’. At least until they can’t afford it. The result of ceding control over journal archives has not been more access, but less. As Benjamin Franklin might have said if he was a librarian: those who would give up essential liberty, to purchase a little access, deserve neither and will lose both. From the very beginning of the LOCKSS Program 17 years ago, the goal has been to provide librarians with the tools they need to take control and ownership of the content they pay for. As I write, JSTOR has been unable to deliver articles for three days and libraries all over the world have been deprived of access to all the content they have paid JSTOR for through the years. Had they owned copies of the content, as they did on paper, no such system-wide failure would have been been possible. Back in May I posted Time For Another IoT Rant. Since then I've added 28 comments about the developments over the last 132 days, or more than one new disaster every 5 days. Those are just the ones I noticed. So its time for another dispatch from the front lines of the IoT war zone on which I can hang reports of the disasters to come. Below the fold, I cover yesterday's happenings on two sectors of the front line. Tuesday, Cory Doctorow pointed to "another of [Maciej Cegłowski's] barn-burning speeches". It is entitled What Happens Next Will Amaze You and it is a must-read exploration of the ecosystem of the Web and its business model of pervasive surveillance. I commented on my post from last May Preserving the Ads? pointing to it, because Cegłowski goes into much more of the awfulness of the Web ecosystem than I did. Yesterday Doctorow pointed to another of Maciej Cegłowski's barn-burning speeches. This one is entitled Haunted by Data, and it is just as much of a must-read. Doctorow is obviously a fan of Cegłowski's and now so am I. It is hard to write talks this good, and even harder to ensure that they are relevant to stuff I was posting in May. This one takes the argument of The Panopticon Is Good For You, also from May, and makes it more general and much clearer. Below the fold, details. After patting myself on the back about one good prediction, here is another. 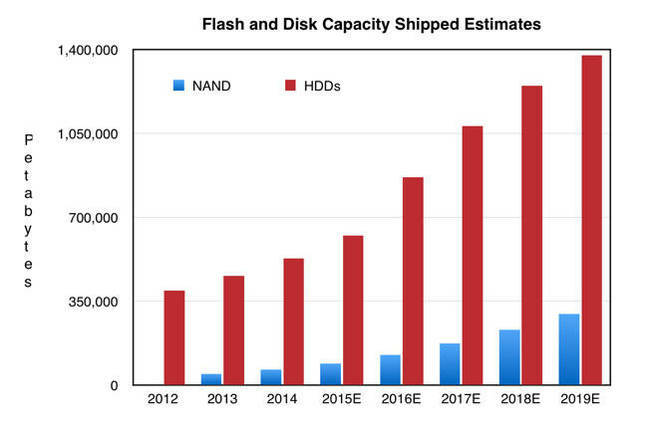 Ever since Dave Anderson's presentation to the 2009 Storage Architecture meeting at the Library of Congress, I've been arguing that for flash to displace disk as the bulk storage medium would require flash vendors to make such enormous investments in new fab capacity that there would be no possibility of making an adequate return on the investments. Since the vendors couldn't make money on the investment, they wouldn't make it, and flash would not displace disk. 6 years later, despite the arrival of 3D flash that is still the case. expected to account for less than 10 per cent of the total storage capacity the industry will need by 2020. Samsung is estimated to be spending over $23bn in capex on its 3D NAND for for an estimated ~10-12 exabytes of capacity. If it is fully ramped-in by 2018 it will make about 1% of what the disk manufacturers will that year. So the investment to replace that capacity would be $2.3T, which clearly isn't going to happen. Unless the investment to make a petabyte of flash per year is much less than the investment to make a petabyte of disk, disk will remain the medium of choice for bulk storage. I've had occasion to note the work of Steve Randy Waldman before. Today, he has a fascinating post up entitled 1099 as Antitrust that may not at first seem relevant to digital preservation. Below the fold I trace the important connection. Winston Smith in "1984" was "a clerk for the Ministry of Truth, where his job is to rewrite historical documents so that they match the current party line". George Orwell wasn't a prophet. Throughout history, governments of all stripes have found the need to employ Winston Smiths and the US government is no exception. Government documents are routinely recalled from the FDLP, and some are re-issued after alteration. Anne Kingston at Maclean's has a terrifying article, Vanishing Canada: Why we’re all losers in Ottawa’s war on data, about the Harper administration's crusade to prevent anyone finding out what is happening as they strip-mine the nation. They don't even bother rewriting, they just delete, and prevent further information being gathered. The article mentions the desperate struggle Canadian government documents librarians have been waging using the LOCKSS technology to stay ahead of the destruction for the last three years. They won this year's CLA/OCLC Award for Innovative Technology, and details of the network are here. Read the article and weep. The LOCKSS Program develops and supports libraries using open source peer-to-peer digital preservation software. Although initial development and deployment was funded by grants including from NSF and the Mellon Foundation, grant funding is not a sustainable basis for long-term preservation. The LOCKSS Program runs the "Red Hat" model of free, open source software and paid support. From 2007 through 2012 the program was in the black with no grant funds at all. The demands of the "Red Hat" model make it hard to devote development resources to enhancements that don't address immediate user demands but are targeted at longer-term issues. After discussing this issue with the Mellon Foundation, the LOCKSS Program was awarded a grant to cover a specific set of infrastructure enhancements. It made significant functional and performance improvements to the LOCKSS software in the areas of ingest, preservation and dissemination. The LOCKSS Program's experience shows that the "Red Hat" model is a viable basis for long-term digital preservation, but that it may need to be supplemented by occasional small grants targeted at longer-term issues. Among the enhancements described in the paper are implementations of Memento (RFC7089) and Shibboleth, support for crawling sites that use AJAX, and some significant enhancements to the LOCKSS peer-to-peer polling protocol. My third post to this blog, more than 8 years ago, was entitled Format Obsolescence: the Prostate Cancer of Preservation. In it I argued that format obsolescence for widely-used formats such as those on the Web, would be rare. If it ever happened, would be a very slow process allowing plenty of time for preservation systems to respond. Thus devoting a large proportion of the resources available for preservation to obsessively collecting metadata intended to ease eventual format migration was economically unjustifiable, for three reasons. First, the time value of money meant that paying the cost later would allow more content to be preserved. Second, the format might never suffer obsolescence, so the cost of preparing to migrate it would be wasted. Third, if the format ever did suffer obsolescence, the technology available to handle it when obsolescence occurred would be better than when it was ingested. Below the fold, I ask how well the predictions have held up in the light of subsequent developments? Prediction: "Security will be an on-going challenge"
The Library of Congress' Storage Architectures workshop asked gave a group of us each 3 minutes to respond to a set of predictions for 2015 and questions accumulated at previous instances of this fascinating workshop. Below the fold, the brief talk in which I addressed one of the predictions. At the last minute, we were given 2 minutes more, so I made one of my own. I've been writing a report about emulation as a preservation strategy. Below the fold, a discussion of one of the ideas that I've been thinking about as I write, the unique position national libraries are in to assist with building the infrastructure emulation needs to succeed. In less than a decade, Dr. Aad, who lives in Marseilles, France, has appeared as the lead author on 458 scientific papers. Nobody knows just how many scientists it may take to screw in a light bulb, but it took 5,154 researchers to write one physics paper earlier this year—likely a record—and Dr. Aad led the list. His scientific renown is a tribute to alphabetical order. Of course, it is true that in some fields doing any significant research requires a large team, and that some means of assigning credit to team members is necessary. But doing so by adding their names to an alphabetized list of authors on the paper describing the results has become an ineffective way of doing the job. If each author gets 1/5154 of the credit for a good paper it is hardly worth having compared to the whole credit for a single-author bad paper. 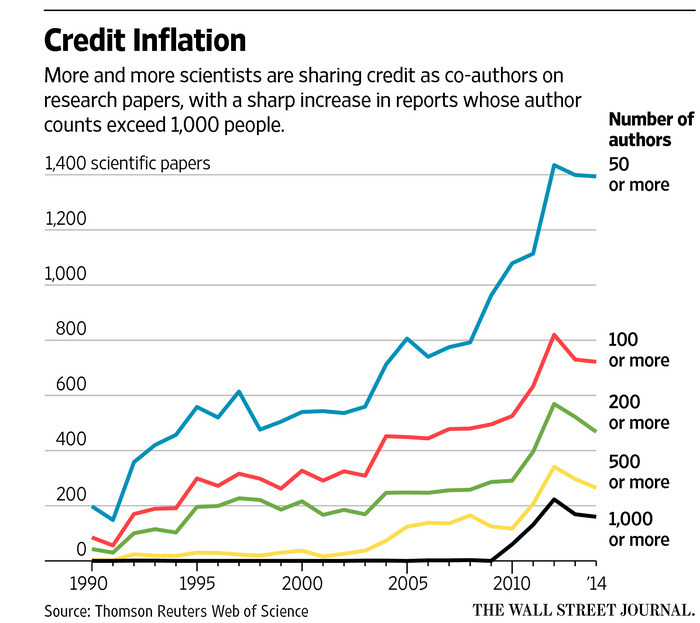 If each of the 5154 authors gets full credit, the paper generates 5145 times as much credit as it is due. And if the list is alphabetized but is treated as reflecting contribution, Dr. Aad is a big winner. How long before the first paper is published with more authors than words? Although at last count I'm a named inventor on at least a couple of dozen US patents, I've long believed that the operation of the patent system, like the copyright system, is profoundly counter-productive. Since "reform" of these systems is inevitably hijacked by intellectual property interests, I believe that at least the patent system, if not both, should be completely abolished. The idea that an infinite supply of low-cost, government enforced monopolies is in the public interest is absurd on its face. Below the fold, some support for my position. Amazon Web Services, ... grew its revenue by 81 percent year on year in the second quarter. It grew faster and with higher profit margins than any other aspect of Amazon’s business. AWS, which offers leased computing services to businesses, posted revenue of $1.82 billion, up from $1 billion a year ago, as part of its second-quarter results. By comparison, retail sales in North America grew only 26 percent to $13.8 billion from $11 billion a year ago. The cloud computing business also posted operating income of $391 million — up an astonishing 407 percent from $77 million at this time last year — for an operating margin of 21 percent, making it Amazon’s most profitable business unit by far. The North American retail unit turned in an operating margin of only 5.1 percent. price competition from the likes of Google, Microsoft and IBM. Amazon's strategy is not to generate and distribute profits, but to re-invest their cash flow into starting and developing businesses. Starting each business absorbs cash, but as they develop they turn around and start generating cash that can be used to start the next one. Unfortunately, S3 is part of AWS for reporting purposes, so we can't see the margins for the storage business alone. But I've been predicting for years that if we could, we would find them to be very generous. Richard Poynder has a depressing analysis of the state of Open Access entitled HEFCE, Elsevier, the “copy request” button, and the future of open access and Bjoern Brembs has a related analysis entitled What happens to publishers that don’t maximize their profit?. They contrast vividly with the Director Zhang's vision for China's National Science Library., and Rolf Schimmer's description of the Max Planck Institute's plans. I expressed doubt that Schimmer's plan would prevent Elsevier ending up with all the money. Follow me below the fold to see how much less optimistic Brembs and Poynder are than I was. The Internet Archive has by far the largest archive of Web content but its preservation leaves much to be desired. The collection is mirrored between San Francisco and Richmond in the Bay Area, both uncomfortably close to the same major fault systems. There are partial copies in the Netherlands and Egypt, but they are not synchronized with the primary systems. This survey also shows that long term preservation planning and strategies are still lacking to ensure the long term preservation of web archives. Several reasons may explain this situation: on one hand, web archiving is a relatively recent field for libraries and other heritage institutions, compared for example with digitization; on the other hand, web archives preservation presents specific challenges that are hard to meet. I discussed the problem of creating and maintaining a remote backup of the Internet Archive's collection in The Opposite of LOCKSS. The Internet Archive isn't alone in having less than ideal preservation of its collection. It's clear the major challenges are the storage and bandwidth requirements for Web archiving, and their rapid growth. Given the limited resources available, and the inadequate reliability of current storage technology, prioritizing collecting more content over preserving the content already collected is appropriate. A Flaw In The Design, discussing the early history of the Internet and how the difficulty of getting it to work at all and the lack of perceived threats meant inadequate security. The Long Life Of A Quick 'Fix', discussing the history of BGP and the consistent failure of attempts to make it less insecure, because those who would need to take action have no incentive to do so. A Disaster Foretold - And Ignored, discussing L0pht and how they warned a Senate panel 17 years ago of the dangers of Internet connectivity but were ignored. Perhaps a future article in the series will describe how successive US administrations consistently strove to ensure that encryption wasn't used to make systems less insecure and, the encryption that was used was as weak as possible. They prioritized their (and their opponents) ability to spy over mitigating the risks that Internet users faced, and they got what they wanted. As we see with the compromise of the Office of Personnel Management and the possibly related compromise of health insurers including Anthem. These breaches revealed the kind of information that renders everyone with a security clearance vulnerable to phishing and blackmail. Be careful what you wish for! 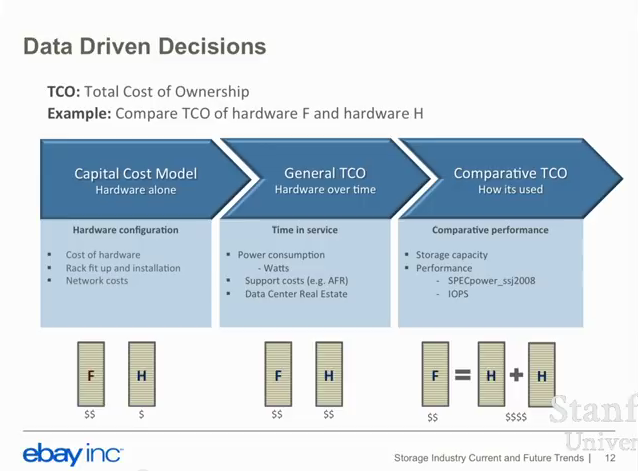 Russ McElroy & Farid Yavari gave a talk to Stanford's EE380 course describing how eBay's approach to storage (YouTube) is driven by their Total Cost of Ownership (TCO) model. As shown in this screengrab, by taking into account all the cost elements, they can justify the higher capital cost of flash media in much the way, but with much more realistic data and across a broader span of applications, that Ian Adams, Ethan Miller and I did in our 2011 paper Using Storage Class Memory for Archives with DAWN, a Durable Array of Wimpy Nodes. We were inspired by a 2009 paper FAWN A Fast Array of Wimpy Nodes in which David Andersen and his co-authors from C-MU showed that a network of large numbers of small CPUs coupled with modest amounts of flash memory could process key-value queries at the same speed as the networks of beefy servers used by, for example, Google, but using 2 orders of magnitude less power. 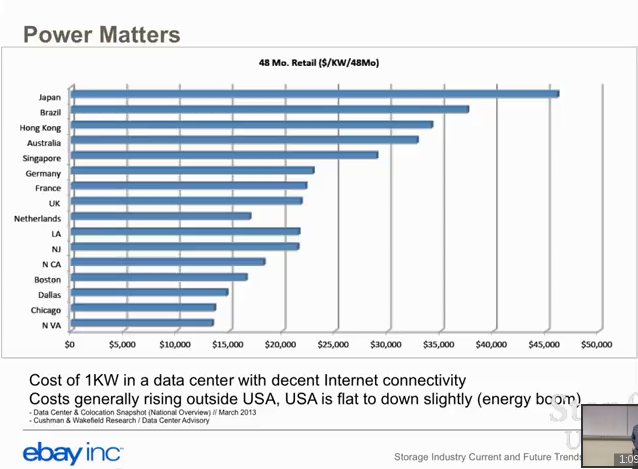 As this McElroy slide shows, power cost is important and it varies over a 3x range (a problem for Kaminska's thesis about the importance of 21 Inc's bitcoin mining hardware). He specifically mentions the need to get the computation close to the data, with ARM processors in the storage fabric. In this way the amount of data to be moved can be significantly reduced, and thus the capital cost, since as he reports the cost of the network hardware is 25% of the cost of the rack, and it burns a lot of power. Fundamentally, tiering like most storage architectures suffers from the idea that in order to do anything with data you need to move it from the storage medium to some compute engine. Thus an obsession with I/O bandwidth rather than what the application really wants, which is query processing rate. 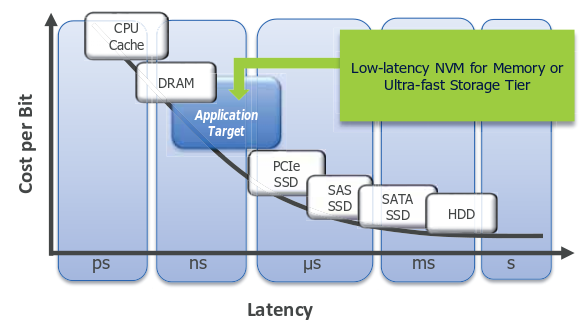 By moving computation to the data on the storage medium, rather than moving data to the computation, architectures like DAWN and Seagate's and WD's Ethernet-connected hard disks show how to avoid the need to tier and thus the need to be right in your predictions about how users will access the data. That post was in part about Facebook's use of tiering, which works well because Facebook has highly predictable data access patterns. McElroy's talk suggests that eBay's data accesses are somewhat predictable, but much less so than Facebook's. This makes his implication that tiering isn't a good long-term approach plausible. For example, let's hypothesise that Tony Soprano was to start a bitcoin loan-sharking operation. The bitcoin network would have no way of differentiating bitcoins being transferred from his account with conditions attached - such as repayment in x amount of days, with x amount of points of interest or else you and your family get yourself some concrete boots â€” and those being transferred as legitimate and final settlement for the procurement of baked cannoli goods. Now say you've lost all the bitcoin you owe to Tony Soprano on the gambling website Satoshi Dice. What are the chances that Tony forgets all about it and offers you a clean slate? Not high. Tony, in all likelihood, will pursue his claim with you. Indeed, given the high volume of fraud and default in the bitcoin network, chances are most bitcoins have competing claims over them by now. Put another way, there are probably more people with legitimate claims over bitcoins than there are bitcoins. And if they can prove the trail, they can make a legal case for reclamation. This contrasts considerably with government cash. In the eyes of the UCC code, cash doesn't take its claim history with it upon transfer. To the contrary, anyone who acquires cash starts off with a clean slate as far as previous claims are concerned. ... According to Fogg there is currently only one way to mitigate this sort of outstanding bitcoin claim risk in the eyes of US law. ... investors could transform bitcoins into financial assets in line with Article 8 of the UCC. By doing this bitcoins would be absolved from their cumbersome claim history. The catch: the only way to do that is to deposit the bitcoin in a formal (a.k.a licensed) custodial or broker-dealer agent account. In other words, to avoid the lien problem you have to submit to government regulation, which is what Bitcoin was supposed to escape from. Government-regulated money comes with a government-regulated dispute resolution system. Bitcoin's lack of a dispute resolution system is seen in the problems Ross Ulbricht ran in to. Below the fold, I start from some of Kaminska's more recent work and look at another attempt to use the blockchain as a Solution to Everything. I did not do this. Instead, over the years, I only enabled others to do it, as some small salve to my conscience. In fact, I made a career out of explaining surveillance and security, what the net was doing and how, but on platforms that were violating my readers as far as technically possible. We can become wizards in our own right, a world of wizards, not subject to the old powers that control us now. But it’s going to take a lot of work. We’re all going to have to learn a lot — the journalists, the readers, the next generation. Then we’re going to have to push back on the people who watch us and try to control who we are. a 67.5% reduction in the number of HTTP cookies set during a crawl of the Alexa top 200 news sites. [and] a 44% median reduction in page load time and 39% reduction in data usage in the Alexa top 200 news site. This is just a quick note to flag two good recent posts on important but extremely difficult problem of archiving computer games. Gita Jackson at Boing-Boing in The vast, unplayable history of video games describes the importance to scholars of archiving games. Kyle Orland at Ars Technica in The quest to save today’s gaming history from being lost forever covers the technical reasons why it is so difficult in considerable detail, including quotes from many of the key players in the space. My colleagues at the Stanford Libraries are actively working to archive games. Back in 2013, on the Library of Congress' The Signal digital preservation blog Trevor Owens interviewed Stanford's Henry Lowood, who curates our games collection. In my recent rant on the Internet of Things, I linked to Mike O'Dell's excellent post to Dave Farber's IP list, Internet of Obnoxious Things, and suggested you read it. I'm repeating that advice as, below the fold, I start from a different part of Mike's post. As Stanford staff I get a feel-good email every morning full of stuff about the wonderful things Stanford is doing. Last Thursday's linked to this article from the medical school about Stanford's annual Big Data in Biomedicine conference. It is full of gee-whiz speculation about how the human condition can be improved if massive amounts of data is collected about every human on the planet and shared freely among medical researchers. Below the fold, I give a taste of the speculation and, in my usual way, ask what could possibly go wrong? I haven't posted on the looming disaster that is the Internet of Things You Don't Own since last October, although I have been keeping track of developments in brief comments to that post. The great Charlie Stross just weighed in with a brilliant, must-read examination of the potential the IoT brings for innovations in rent-seeking, which convinced me that it was time for an update. Below the fold, I discuss the Stross business model and other developments in the last 8 months. Economists like to say there are no bad people, just bad incentives. The incentives to publish today are corrupting the scientific literature and the media that covers it. Until those incentives change, we’ll all get fooled again. Earlier this year I saw Tom Stoppard's play The Hard Problem at the Royal National Theatre, which deals with the same issue. The tragedy is driven by the characters being entranced by the prospect of publishing an attention-grabbing result. Below the fold, more on the problem of bad incentives in science. Trevor Pott has a post at The Register entitled Flash banishes the spectre of the unrecoverable data error in which he points out that while disk manufacturers quoted Bit Error Rates (BER) for hard disks are typically 10-14 or 10-15, SSD BERs range from 10-16 for consumer drives to 10-18 for hardened enterprise drives. Below the fold, a look at his analysis of the impact of this difference of up to 4 orders of magnitude. I started blogging about the transition the Web is undergoing from a document to a programming model, from static to dynamic content, some time ago. This transition has very fundamental implications for Web archiving; what exactly does it mean to preserve something that is different every time you look at it? Not to mention the vastly increased cost of ingest, because executing a program takes a lot more, a potentially unlimited amount of, computation than simply parsing a document. Bina Venkataraman was White House adviser on climate change innovation and is now at the Broad Foundation Institute working on long-term vs. short-term issues. She has a good op-ed piece in Sunday's Boston Globe entitled The race to preserve disappearing data. She and I e-mailed to and fro as she worked on the op-ed, and I'm quoted in it. Update: Bina's affiliation corrected - my bad. We know that those Open Access policies that work are the ones that have teeth. Both institutional and funder policies work better when tied to reporting requirements. The success of the University of Liege in filling its repository is in large part due to the fact that works not in the repository do not count for annual reviews. Both the NIH and Wellcome policies have seen substantial jumps in the proportion of articles reaching the repository when grantees final payments or ability to apply for new grants was withheld until issues were corrected. Each of these steps are difficult or impossible in our current data environment. Each of them could be radically improved with some small steps in policy design and metadata provision, alongside the wider release of data on funded outputs. Identification of Relevant Outputs: Policy design should include mechanisms for identifying and publicly listing outputs that are subject to the policy. The use of community standard persistable and unique identifiers should be strongly recommended. Further work is needed on creating community mechanisms that identify author affiliations and funding sources across the scholarly literature. Discovery of Accessible Versions: Policy design should express compliance requirements for repositories and journals in terms of metadata standards that enable aggregation and consistent harvesting. The infrastructure to enable this harvesting should be seen as a core part of the public investment in scholarly communications. Auditing Policy Implementation: Policy requirements should be expressed in terms of metadata requirements that allow for automated implementation monitoring. RIOXX and ALI proposals represent a step towards enabling automated auditing but further work, testing and refinement will be required to make this work at scale. What he is saying is that defining policies that mandate certain aspects of Web-published materials without mandating that they conform to standards that make them enforceable over the Web is futile. This should be a no-brainer. The idea that, at scale, without funding, conformance will be enforced manually is laughable. The idea that researchers will voluntarily comply when they know that there is no effective enforcement is equally laughable. All the indications are that the money already invested in the research publishing system is sufficient to enable a transformation that will be sustainable for the future. There needs to be a shared understanding that the money currently locked in the journal subscription system must be withdrawn and re-purposed for open access publishing services. The current library acquisition budgets are the ultimate reservoir for enabling the transformation without financial or other risks. generic calculations we have made on the basis of available publication data and revenue values at global, national and institutional levels. These include detailed data as to their own spending on open access article processing charges (APCs), which they have made available on-line, and from many other sources including the Wellcome Trust and the Austrian Science Fund. They show that APCs are less than €2.0K/article while subscription costs are €3.8-5.0K/article, so the claim that sufficient funds are available is credible. It is important to note that they exclude hybrid APCs such as those resulting from the stupid double-dipping deals the UK made; these are "widely considered not to reflect a true market value". As an Englishman, I appreciate under-statement. Thus they support my and Andrew Odlyzko's contention that margins in the academic publishing business are extortionate. Below the fold, I look at some of the details in the paper. The International Internet Preservation Consortium's General Assembly brings together those involved in Web archiving from around the world. This year's was held at Stanford and the Internet Archive. I was asked to give a short talk outlining the LOCKSS Program, explaining how and why it differs from most Web archiving efforts, and how we plan to evolve it in the near future to align it more closely with the mainstream of Web archiving. Below the fold, an edited text with links to the sources. One of the most interesting sessions at the recent CNI was on the Ontario Library Research Cloud (OLRC). It is a collaboration between universities in Ontario to provide a low-cost, distributed, mutually owned private storage cloud with adequate compute capacity for uses such as text-mining. Below the fold, my commentary on their presentations. Two recent papers examine the growth of peer-to-peer sharing of journal articles. Guilliame Cabanac's Bibliogifts in LibGen? A study of a text-sharing platform driven by biblioleaks and crowdsourcing (LG) is a statistical study of the Library Genesis service, and Carolyn Caffrey Gardner and Gabriel J. Gardner's Bypassing Interlibrary Loan via Twitter: An Exploration of #icanhazpdf Requests (TW) is a similar study of one of the sources for Library Genesis. Both implement forms of Aaron Swartz's Guerilla Open Access Manifesto, a civil disobedience movement opposed to the malign effects of current copyright law on academic research. Below the fold, some thoughts on the state of this movement. As of 24th March 2015, a selection of authors submitting a biology manuscript to Scientific Reports will be able to opt-in to a fast-track peer-review service at an additional cost. Authors who opt-in to fast-track will receive an editorial decision (accept, reject or revise) with peer-review comments within three weeks of their manuscript passing initial quality checks. It is true that the review process is irritatingly slow, but this is a bad idea on many levels. Such a bad idea that an editorial board member resigned in protest. Below the fold I discuss some of the levels. The Andrew W. Mellon Foundation is aggressively funding efforts to support new forms of academic publishing, which researchers say could further legitimize digital scholarship. The foundation in May sent university press directors a request for proposals to a new grant-making initiative for long-form digital publishing for the humanities. In the e-mail, the foundation noted the growing popularity of digital scholarship, which presented an “urgent and compelling” need for university presses to publish and make digital work available to readers. Below the fold, some thoughts on this based on experience from the LOCKSS Program. Jill Lepore's New Yorker "Cobweb" article has focused attention on the importance of the Internet Archive, and the analogy with the Library of Alexandria. In particular on the risks implicit in the fact that both represent single points of failure because they are so much larger than any other collection. Typically, Jason Scott was first to respond with a outline proposal to back up the Internet Archive, by greatly expanding the collaborative efforts of ArchiveTeam. I think Jason is trying to do something really important, and extremely difficult. The Internet Archive's collection is currently around 15PB. It has doubled in size in about 30 months. Suppose it takes another 30 months to develop and deploy a solution at scale. We're talking crowd-sourcing a distributed backup of at least 30PB growing at least 3PB/year. To get some idea of what this means, suppose we wanted to use Amazon's Glacier. This is, after all, exactly the kind of application Glacier is targeted at. As I predicted shortly after Glacier launched, Amazon has stuck with the 1c/GB/mo price. So in 2017 we'd be paying Amazon $3.6M a year just for the storage costs. Alternately, suppose we used Backblaze's Storage Pod 4.5 at their current price of about 5c/GB, for each copy we'd have paid $1.5M in hardware cost and be adding $150K worth per year. This ignores running costs and RAID overhead. It will be very hard to crowd-source resources on this scale, which is why I say this is the opposite of Lots Of Copies Keep Stuff Safe. The system is going to be short of storage; the goal of a backup for the Internet Archive must be the maximum of reliability for the minimum of storage. Nevertheless, I believe it would be well worth trying some version of his proposal and I'm happy to help any way I can. Below the fold, my comments on the design of such a system. The exponential growth in the number of scientific papers makes it increasingly difficult for researchers to keep track of all the publications relevant to their work. Consequently, the attention that can be devoted to individual papers, measured by their citation counts, is bound to decay rapidly. ... The decay is ... becoming faster over the years, signaling that nowadays papers are forgotten more quickly. However, when time is counted in terms of the number of published papers, the rate of decay of citations is fairly independent of the period considered. This indicates that the attention of scholars depends on the number of published items, and not on real time. Below the fold, some thoughts. The current empirical literature on the effects of journal rank provides evidence supporting the following four conclusions: 1) Journal rank is a weak to moderate predictor of scientific impact; 2) Journal rank is a moderate to strong predictor of both intentional and unintentional scientific unreliability; 3) Journal rank is expensive, delays science and frustrates researchers; and, 4) Journal rank as established by [Impact Factor] violates even the most basic scientific standards, but predicts subjective judgments of journal quality. Subsequent events justify skepticism about the net value journals add after allowing for the value they subtract. Now the redoubtable Eric Hellman points out another value-subtracted aspect of the journals with his important post entitled 16 of the top 20 Research Journals Let Ad Networks Spy on Their Readers. Go read it and be appalled. I'm particularly concerned about the medical journals that participate in advertising networks. Imagine that someone is researching clinical trials for a deadly disease. A smart insurance company could target such users with ads that mark them for higher premiums. A pharmaceutical company could use advertising targeting researchers at competing companies to find clues about their research directions. Most journal users (and probably most journal publishers) don't realize how easily online ads can be used to gain intelligence as well as to sell products. If you want to look up health information online, you need to use Tor. It claims to have much lower latency, a few seconds instead of a few hours. It has the same (synchronous) API as Google's more expensive storage, where Glacier has a different (asynchronous) API than S3. Its pricing for getting data out lacks Glacier's 5% free tier, but otherwise is much simpler than Glacier's. As I predicted at Glacier's launch, Amazon stuck with the 1c/GB/mo price point while, albeit slowly, the technology got cheaper. So they have room to cut prices in response, but I'd bet that they won't. I believe I know how Google has built their nearline technology, I wrote about it two years ago. Tom Coughlin uses Hetzler's touch-rate metric to argue for tiered storage for archives in a two-part series. Although there's good stuff there, I have two problems with Tom's argument. Below the fold, I discuss them. I wasn't able to attend IDCC2015 two weeks ago in London, but I've been catching up with the presentations on the Web. Below the fold, my thoughts on a few of them. I was one of the crowd of people who reacted to Wednesday's news that Argonne National Labs would shut down the NEWTON Ask A Scientist service, on-line since 1991, this Sunday by alerting Jason Scott's ArchiveTeam. Jason did what I should have done before flashing the bat-signal. He fed the URL into the Internet Archive's Save Page Now, to be told "relax, we're all over it". The site has been captured since 1996 and the most recent capture before the announcement was Feb 7th. Jason arranged for captures Thursday and today. As you can see by these examples, the Wayback Machine has a pretty good copy of the final state of the service and, as the use of Memento spreads, it will even remain accessible via its original URL. I realize that it may not be obvious exactly how to use the newly-official Linux overlayfs implementation. Below the fold, some example shell scripts that may help clarify things.